Have you tried The Truly Awesome™ product line, available at Kroger, Fred Meyer and Ralph’s grocery stores? The Truly Awesome™ product line seeks to bring homemade flavors to store brand products. I will admit that I have a few Kroger store brand products that I prefer over brand name alternatives for both price and taste—so, when I was given the chance to review The Truly Awesome™ Homestyle Chocolate Chip Cookies—I was more than willing to give them a try. 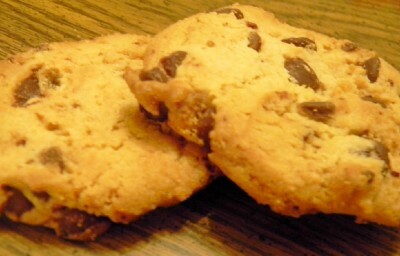 How did The Truly Awesome™ Homestyle Chocolate Chip Cookies stand up to review in A Mama’s Corner of the World? When we review products, we look at three basic factors: (1) Convenience/Ease of use—Families are busy and products must be easy to obtain and use. (2) Product taste and quality. Poor quality products are a waste of money—and families cannot afford that. Products need to stand up to product claims as best as can be expected, and need to be appealing. (3) Value. Obviously, in today’s economy, the product must be worth its price tag. Are Kroger’s The Truly Awesome™ Homestyle Chocolate Chip Cookies convenient and easy to use? Kroger’s The Truly Awesome™ Homestyle Chocolate Chip Cookies are readily available in the prepackaged cookie aisle—near specialty cookies such as Pepperidge Farm and Mrs. Fields. The chocolate chip cookies are packaged in a box that’s closable—but, I would have preferred a better storage container for keeping the cookies fresh if buying them as an occasional snack rather than a dessert offering. Taste and quality are two of the most important cookie characteristics, right? 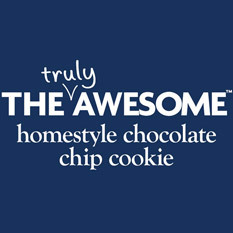 Kroger’s The Truly Awesome™ Homestyle Chocolate Chip Cookies tasted very good. The cookies were large, crunchy, packed with chocolate chips and were certainly better than most commercial, bagged chocolate chip cookies. The girls especially liked them warmed slightly in the microwave for a “fresh from the oven” taste. It was also nice to see an ingredient listing noting chocolate chips and real butter—without a longer list of additives, artificial flavors and preservatives. Are Kroger’s The Truly Awesome™ Homestyle Chocolate Chip Cookies worth the price? Kroger’s The Truly Awesome™ Homestyle Chocolate Chip Cookies are packaged 8 to a box and retail for around $2.79. While the cookies are good—they are simple chocolate chip cookies. No expensive ingredients or fancy add-ins. I would have a hard time rationalizing nearly $3.00 for 8 cookies when store bakeries sometimes offer 30 (or more) for $3.99—and those are even double chocolate chunk or white chocolate chip with macadamia nuts. As an alternative to brand named, specialty cookies such as Pepperidge Farm--the Kroger The Truly Awesome™ Homestyle Chocolate Chip Cookies also have a tougher time standing up to fancier competition. Overall opinion of Kroger’s The Truly Awesome™ Homestyle Chocolate Chip Cookies. If you are a fan of simple, chocolate chip cookies—or want an alternative to specialty cookies—they are well worth a taste. I would probably buy them again if I found them on sale or with a store coupon. I would certainly be willing to check out the other products in the store's The Truly Awesome™ line. Check out the websites for more information on the Kroger Family of Stores and Kroger’s Truly Awesome Line of products. Disclaimer: I received (2) complementary boxes of Kroger’s The Truly Awesome Homestyle Chocolate Chip Cookies to sample for this review through my affiliation with BzzAgent. As always, my opinions and views are my own and are in no way influenced by the brand or affiliations noted.